The Alps is a prosperous region with modern industries supplementing the traditional farming and cheesemaking economy. Tourism, increasingly a year-round business, offers employment not just to French natives but expat owners of French Alps property too. Grenoble is also a hub for technology and the sciences, while crossing the border to work in Geneva’s global financial and diplomatic institutions is not uncommon. English is spoken in cities and ski-resorts but since French is the official language it’s preferable - and polite - to speak it. Likewise, international schools and English/French speaking montessories are available, but local state schools expect their non-native pupils to converse in French. The French Alps offer abundant leisure options. Winter skiing, boarding, snow-walking and the apre-ski for which exclusive resorts Courchevel and Meribel are renowned, are complemented by summer hiking, mountain-biking and sailing. Alpine spa towns such as Evian-les-bains also offer theatre and festivals. Savoyard specialities like Raclette - a melted cheese feast - are a welcome dish after a day’s exertion on the slopes in many a relaxed bistro near the picturesque ski-chalets in les Allues. If you own a ski-chalet in Courchevel, you’ll also know about the gourmet options at the resort’s clutch of Michelin starred restaurants. Entrepreneurs, luxury-seekers, families and winter-sports enthusiasts alike are spoilt for choice with the quality and quantity of property for sale in the French Alps. In Courchevel alone, four distinct neighbourhoods catering to varying budgets descend the mountain, from Courchevel 1850 at the top, to Courchevel La Praz 1300 at the bottom. Breathtaking new-build chalets in Courchevel 1850’s resort centre incorporate home spas and cinemas in a private development. All just a stone’s throw from the fine dining restaurants, nightclubs and boutiques that distinguish Courcheval as a dazzling ski-destination. 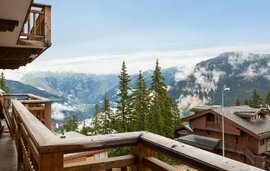 Equally, you can purchase an elegant chalet in Courchevel La Praz with change to spare. As rustic as its mountain-top neighbour is glamorous, La Praz enjoys a peaceful village setting with connection to the bustling centre and the superior quality “powder” of the upper slopes by a cable-car ride. Let us assist you in finding your perfect villa, apartment, holiday home or investment property in French Alps, France. For more details, call us on + 44 (0) 207 870 7181 or contact our estate agents in France. Courchevel opens for business all year. Its endless appeal for those seeking a luxury alpine holiday - whatever the season - makes it an attractive prospect for both investors and private buyers seeking prestigious holiday homes in France. Further south, the village of Les Allues - tucked beneath the slopes of Meribel - offers wooded plots with valley views. 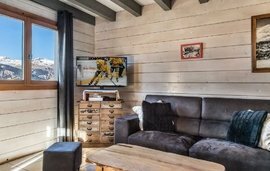 Catered chalets for families and groups in Les Allues and the nearby resort of La Tania can be lucrative. Some ski-chalets in the French Alps are now designed to incorporate separate owner/staff quarters. For die-hard skiers who spend all their time on the black runs, ski in/ski out chalets and apartments in the Alps have grown in popularity. If you’re charmed by the look and feel of a traditional chalet and you want pistes catering for beginners to experienced skiers, Meribel is the ski-resort for you. You’ll also find a friendly expat community. Meanwhile, contemporary chalets in Avoriaz - known as the French snowboarding capital - allow customisation of the interior design. Winkworth International has a comprehensive portfolio of quality properties and would be happy to help you with your purchase or sale of a French Alps property. Contact us with your requirements.